DataSunrise Data Audit performs non-stop tracking of database activity and logs all the essential data for cybercrime investigation. Monitoring ability keeps you on track of the current condition of your database, providing the opportunity to reveal potential threats and timely react to security issues. Percona audit feature plays an important role in database protection. It also provides assistance in compliance with privacy and security mandates established by SOX, PCI-DSS, HIPAA and other regulators. Comprehensive database security cannot be built without an audit tool. Not only it is required by cybersecurity regulations but it plays an important role in keeping the database safe. 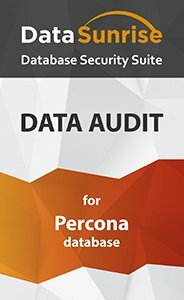 DataSunrise Data Audit for Percona Server database analyzes and keeps track of all incoming and outcoming transactions collecting required set of logs for analyzing the current state of the database and investigation of cybersecurity incidents. Editing/creating/deleting database user profiles, etc. Audit rule settings of DataSunrise Data Audit are flexible and can be managed to collect only selected type of data. The solution can be integrated with SIEM systems to provide real-time analysis of security threats. The application is easily deployed and it doesn’t affect the database performance. To automate security maintaining procedures, DataSunrise has a self-learning mode, in which it examines the queries and generates the list of SQL queries that are assumed safe for the particular environment. Our solution detects SQL injections, unauthorized access attempts and notifies assigned subscribers about the potentially dangerous activity. It also tracks the actions of privileged users to secure from insider threats. For complying SOX, GLBA, HIPAA, PCI DSS, DataSunrise Data Audit for Percona databases generates reports for various types of data. Reports can also be configured to be sent to subscribers automatically per specified period of time. DataSunrise Data Audit for Percona databases is a reliable solution that provides nonstop database monitoring, collects data for regulatory compliance and helps to keep Percona databases safe.